Homemakin and Decoratin: Happy Good Friday! I know I've shared this before, but these are the lyrics to one of my favorite songs. It moves my heart to tears each time I hear it and read these words. 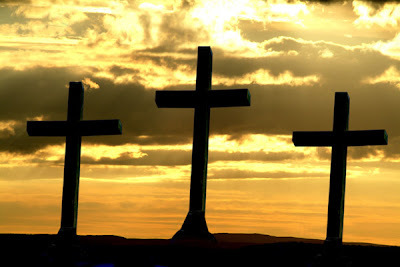 May we never forget what our Lord did for us that day on the cross.. giving up all of Himself to save us sinful people. He is GOOD. My Jesus, fair, was pierced by thorns, by thorns grown from the fall. Thus He who gave the curse was torn, to end that curse for all. My Jesus, meek, was scorned by men, by men in blasphemy. “Father, forgive their senseless sin!” He prayed, for them, for me. My Jesus, kind, was torn by nails, by nails of cruel men. And to His cross, as grace prevailed, God pinned my wretched sin. My Jesus, pure, was crushed by God, by God, in judgment just. The Father grieved, yet turned His rod, on Christ, made sin for us. My Jesus, strong, shall come to reign, to reign in majesty. The Lamb arose, and death is slain. Lord, come in victory! And may we also never forget that death could not KEEP Him! Isaiah 53:5- "But He was wounded for our transgressions, He was bruised for our iniquities: the chastisement of our peace was upon Him; and WITH HIS STRIPES WE ARE HEALED." Have a great Easter weekend, remembering our Savior! New Shop Item Coming and Giveaway!